Until recently I’d never thought about writing historical novels as an extension of what is known as microhistory. Some examples of microhistory you might know are The Return of Martin Guerre by Natalie Zemon Davis (Harvard University Press, 1984) and Montaillou (Penguin reprint, 2002) by Emmanuel Le Roy Ladurie, two of my favorite such books. If you haven’t read them yet, I highly recommend them—the first recounts a 16th century case of identity theft, the second is about a village in southern France caught up in the Cathar heresy. In both books, the authors use the historical record to chronicle the lives of common folk in a moment of crisis or controversy. It’s not so different from the aim of a novelist writing about a particular moment in history, though perhaps we (novelists) are as likely to focus on the powerful as on the common folk. Even so, in essence where we diverge is in how we write the tale—the microhistorian stays with the facts, fleshing them out only insofar as there is evidence to do so; the historical novelist takes the facts and fashions a story connecting the dots, creating fictional characters to fill the void, adding depth to actual historic figures with educated guesses. In my crime novels, I fashion stories that I feel are plausible given my research, and though I do include some actual figures, most of my characters are my invention, using characteristics and often basic storylines and lifelines encountered in my research–so in these I diverge even more from the microhistories, and yet I feel a stronger kinship with the writers of the genre than when I’m writing about royalty and the royal court. 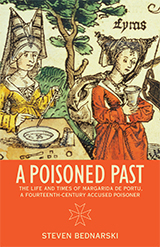 I’ve been thinking about this while reading a recent publication in this genre, A Poisoned Past: The Life and Times of Margarida de Portu, a Fourteenth-Century Accused Poisoner by Steven Bednarski (University of Toronto Press, 2014). I had the great good fortune to review it for the Medieval Feminist Forum. The story: On a fateful day in 1394, Johan Damponcii ate his breakfast in the company of his wife, friends, and servants, then went out to work in the fields, where he fell ill, stumbled home, withdrew to his bed, and died in mid-afternoon. Almost immediately a rumor spread through the town (Manosque, Provence) that his young wife, Margarida de Portu, to whom Johan had been wed only a few months, had either poisoned him or killed him by sorcery. The rumor was spread by her in-laws, or, more specifically, her late husband’s half-brother Raymon Gauterii, a litigious citizen of Manosque who happened to be a notary. The book recounts not only the murder trial but the ongoing litigation between Raymon and Margarida; Raymon is quite the character, and Margarida a strong woman, a survivor. Or so it seems in this author’s interpretation of the records. What is special about this book (beyond a great story and fascinating background material) is that Steven Bednarski interrupts himself throughout the book “to interrogate how we know what we think we know about Margarida and her world…” and suggests how someone with a specific interest—perhaps in the history of law or gender history—might arrive at quite a different interpretation. (xvii) Novelists, historians–we all bring our own predilections to our interpretations of the historical record. Raymon Gauterii failed to mention Margarida’s medical condition in his accusations, a condition that often left her quite debilitated. But the other witnesses filled in the details—the Jewish physician, the midwife, Raymon’s sisters, neighbors, the deceased’s servant. All of these villagers are wonderfully individual and their voices enliven the text. Can you tell I enjoyed this book? So now you have three more books to add to your pile of to-be-read. Actually, I’m reading another book that could be classified a microhistory, Paul Strohm’s Chaucer’s Tale: 1386 and the Road to Canterbury (Viking 2014). It’s just out–and Paul’s graciously agreed to a Q&A on this blog. So watch this space! Thank you for the reading suggestions. Will order them promptly. Your enthusiasm encourages me to go back to a historical manuscript I wrote long ago and infuse it with a deeper story. Well, I consider that a good day’s work! Easier said than done. The manuscript was so horrid, I unceremoniously placed in an unmarked grave. Luckily I kept all the research. Amazon was having a 30% off print books today, so you’re timing was perfect.